Which are the best smelling orchids? Stanhopeas get my vote every time. Vanilla, chocolate, wintergreen. One of our stanhopeas, I discovered last week, has a fragrance that my nose recognizes as cinnamon. Our stanhopeas are knocking themselves out this year. 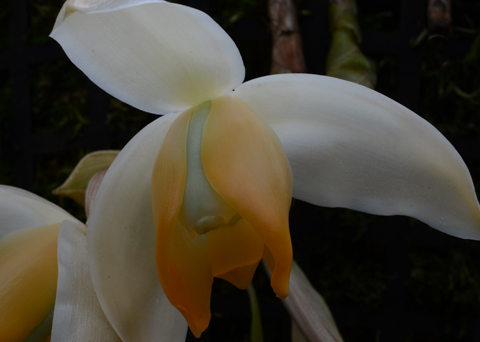 If one Stanhopea plant smells like vanilla cream icing, imagine a half dozen flowering simultaneously. Some afternoons the Orchid Display House smells like a bakery. (Until you get to the bulbophyllums, that is). Stanhopea tigrina (above) has a fragrance that is 90% phenyl ethyl acetate, a not uncommon floral constituent described as very sweet, rosy, fruity and honey-like. You can actually buy it online. 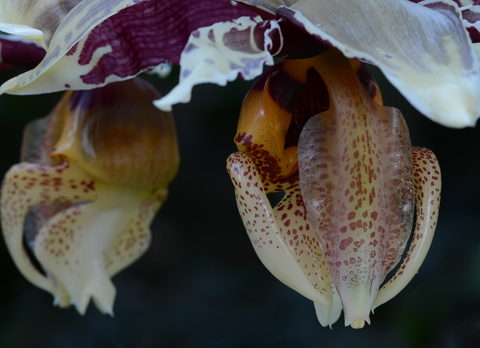 However, the fragrance of Stanhopea tigrina is complex and is dominated by other compounds, like raspberry ketone and vanilline and courmarine, giving it a sweet-spicy scent unique among orchids. Stanhopea tigrina grows on the Atlantic side of Mexico. Stanhopea tigrina is known as El Toro in Latin America on account of the horns projecting from either side of the lip. 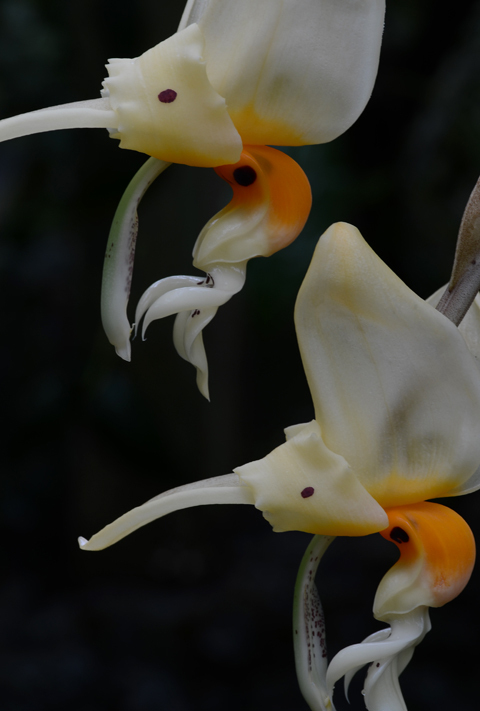 In fact, most of the 55 or so species of Stanhopea have horns. The horns guide the pollinator, a fragrance-collecting male Euglossine bee, toward the pollinia located at the end of the downward arching column. Stanhopea tricornis is one of a handful of stanhopeas without horns on the lip.